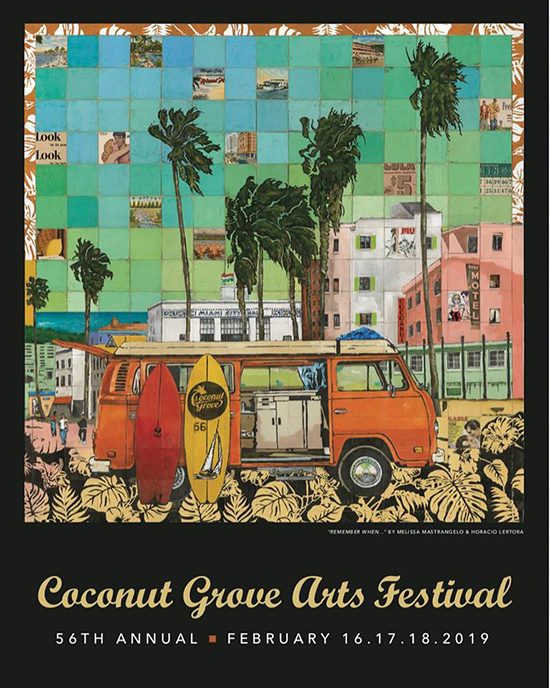 This is the 2019 Coconut Grove Arts Festival poster which was unveiled Thursday at Hotel Aria. The artists are husband and wife Melissa Mastrangelo and Horacio Lertora from Boyton Beach, Florida. The work of these two artists, who call their collaboration ROAME (pronounced “roam”), is defined by a symbiotic relationship between strong singular subjects interacting with a layered background, full of visual surprises. The inspiration is derived from advertising posters, billboards, popular culture, street art, vintage comics, quilting patterns, as well as the appreciation of distressed objects, particularly wood and paper. The Coconut Grove Arts Festival and The St. Stephen's Art Show are February 16-18, 2019. The St. Stephen's poster will be unveiled next week, it's by local artist Larry Shane, who we profiled earlier this month. Depicts what the Grove is turning into, not much of a "grove" of coconuts anymore, huh, lots of concrete instead. Excellent rendition sans the wrecking ball. Interesting choice of colors. Dark, as in the mood in Coconut Grove these days. Oh yes, I remember when I was young and surfed....in Coconut Grove? About as much Grove soul as one of those abhorrent white boxes. Has nothing to do with the Grove. Looks more like South Beach! Why not use a Coconut Grove artist, like the wonderful Lisa Remeny for example? Or Carol Garvin another great CG artist? missing white boxes, construction and not a peacock in sight... congrats to the no-nothing artists on winning the highest bid. I like the dying plants in the foreground, very reminiscent of the new motto, "Out with the plants, in with the concrete!" They couldn't even get City Hall correct. It appears they show a three story square building with columns. Like they never even visited the Grove! What were they thinking? @anon 7:55 This just looks so much like a view of Ocean Dr I’m thinking maybe this was a promo idea on the back burner and the artists just switched out a Miami Beach building and made one roughly based on City Hall. It’s ironic, considering how long many of the Grove residents have been voicing their desire to secede from the City of Miami, that the only thing that actually represents the Grove in the poster is City Hall. Why is there a Hungarian flag o'er the Miami City Hall? Anon 10:20, that's a great idea to do a reality poster. In fact the idea is so good I suggest someone do an underground poster like you describe and I'd donate funds to sell it throughout the Grove during the CG Art Show - - - - just for the fun of it. All profit, minus my investment would go to the artist(s) who create such a concept. For dunding I can be reached by going to jobiesteppe.com. Jeezuz, what negativity. I'm far more linear: I think it's simply unattractive. That's all. Unattractive is an understatement. This image fails to capture our past or our future. Unattractive, try nothingness, unimaginative, and say what "linear", right on dog and absolutely negative, a waste of time and potential to attract folks to our Grove. Oh yes, DULL also comes to mind. The Arts Festival is a giant waste of time with very few things that remotely pass as art. This poster sums it up perfectly. Kudos to the artist. Anon 5:45, respectfully/sincerely, are U stating or suggesting "Kudos to the artist" because the artists rendition conscientiously, purposefully, willfully wanted to denounce the CG art show for the reason(s) you stated? 5:45 Anon commenting on your comment that the CG Arts Festival is a waste of time. At some level I agree, but throughout this planet, for example: Ground Hog Day, or some wine or beer fest, rodeos, auto, monster or demolition car races, home town parades, the ball falling in NY on New Years Eve, etc., etc., and etc(s).. On one hand it's all a waste, on the other it gives folks (tribes) some cohesion, civility and togetherness and that helps construct civilizations & humanity, and yes wars & conflicts. Nice enough poster I guess but I don’t think I have ever see a more incorrect depiction of Coconut Groce! Seriously - surfboards, Art Deco buildings and a motel? The VW van is a stretch back to the 60’s I guess but I would not look at this and think Coconut Grove. This is South Beach. We have so many amazing local artists why do we contract a. Boynton Beach artist? And what country’s flag is that on city hall?